Time does seem to pass faster now that we are in the digital age, doesn’t it? It’s still a bit hard to come to grips with the fact that the 90’s started almost 30 years ago. Yet, those born in 2000 are turning eighteen this year. These ‘kids’ are the so-called Generation Z (born between 1995 and 2015) and are taking the world of sports by storm. This change was already in the making of the millennial generation, but unlike their successors, millennials are more of a transition breed, born and raised predominantly in the pre-internet era. Nevertheless, statistics show that by 2020, 40% of consumers and a third of all US citizens will be, in fact, part of GenZ. That’s less than two years away. And for the great amount of influence this generation will have in the immediate future, many marketers don’t seem to give it too much consideration. This is probably because they’re still trying to figure out millennials to even consider taking on the younger generation. Kids or not, many are already active members of society, either going to college or being part of the workforce. Jonah Stillman, an 18-year-old keynote speaker, author, and generation expert at GenZGuru, is for all intents and purposes the voice of his peers. In September 2017, he was hired by the Minnesota Vikings to conduct research and predict trends based on the viewing habits of his fellow GenZ’ers. In other words, sports content will be highly fragmented and will appear on a multitude of digital channels, other than TV. In fact, the more of these viewing options there are, the more TV will lose its central focus, tying everything together. This trend is already beginning to happen and will only accelerate as time goes on. Such a development presents ample opportunities for sports teams and leagues to engage with their fans in more meaningful and intimate ways. Yet, this diversity in terms of both content and viewing channels can quickly become too complex, being hard to follow, predict, and monetize. Certain platforms such as Fanisko Engage can offer the benefits of both content diversity and the convenience of having that content on the same app. Fans will be able to watch all trending topics about their team without having to change between TV, Twitter, YouTube, Instagram, Snapchat, and Facebook to get it. Highlights, behind-the-scenes moments, games, VR/AR simulations, and other such customizable content will be easily accessible on a single platform. 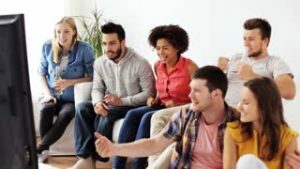 Millennials and GenZ’ers are already the majority of the population and only by addressing their needs and viewing preferences will the sports industry be able to maximize its profits and fan retention capabilities. Times, they are changing.